We want to keep our babies safe, comfortable, and close to us at all times. Baby bassinets are the ideal sleeping solutions when your newborn is sleeping in the same room as you. With the Best Baby Bassinet, you can keep a close eye on your newborn without having to invest in a full-size crib at least for the first couple of months. You get quick access to the baby as you can put the bassinet close to your bed for the smooth feeding. They also provide you with a fast way of comforting your baby since you will be close to them. This way, you can hum away to help your baby sleep, or you can lift them from the bassinet and cuddle them to sleep. 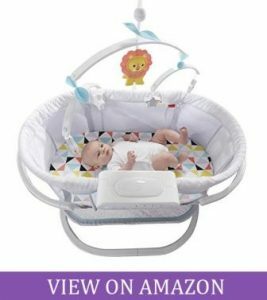 If you are looking for the Best Baby Bassinet, searching the internet will give you hundreds of products that make it hard to pick just one. 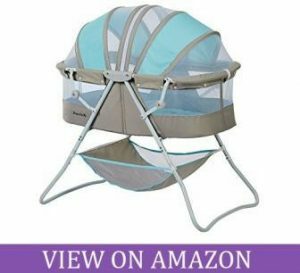 In this article, you are all about Bassinet Reviews as you narrow down to the Best of the Best. 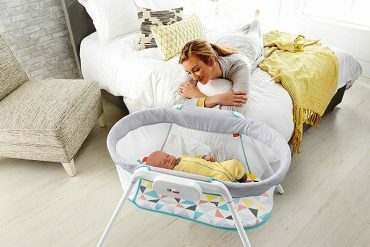 Let’s take a look to all the best baby bassinet 2018. The Graco Pack ‘n Play Playard Snuggle Suite is a well-rounded baby bassinet. It is designed to suit your baby’s needs in and outside the house. This model includes a spacious bassinet that will suit your baby’s napping needs. It provides a familiar place where your baby can feel safe and peaceful at all times. With the transport wheels, it is easy to have your baby close to you without lifting the bassinet. You will love the bouncer seat as it has music and nature sounds to soothe your baby. You will be able to move this seat around the house and use in the most convenient position. We like that the seat includes a harness and a light-shielding canopy. This bassinet comes with your convenience in mind. It has a changing station that can accommodate babies up to 30 pounds. You will use this changing station long after the baby outgrows the bassinet. What’s more, this unit incorporates a storage organizer to keep all the baby essentials at hand. The HALO Bassinet is perhaps the most beautiful white bassinet on our list. It comes in a sturdy structure that looks everything like new furniture. This bassinet can rotate to 360 degrees to make it easy for you to get in and out of bed when your baby is sleeping next to you. The side wall lowers when you are feeding the baby, and it snaps back into position after you release it. You can lock this bassinet in the upright position so your baby will always be safe when other kids are around. We like that the base is height adjustable making it applicable with lots of bed heights. The base can also tuck under the bed. It is an ideal choice when you live in a small apartment since it does not need that much clearance for a comfortable fit. Soothing is also effortless with the HALO Bassinet. It is equipped with three nature and womb songs, three levels of vibration, and three lullabies to make soothing your baby effortless. You also get a nightlight and nursing timer that auto shuts off. If you are looking for a white bassinet, the HALO model is one of the best baby bassinets we have so far. If you want a multipurpose bassinet that will double up as your travel companion, the Chico LullaGo is a must-have. 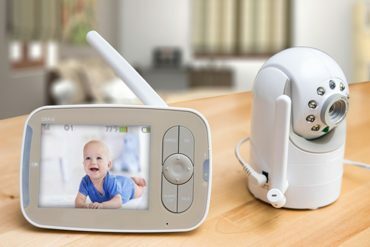 It comes in a pretty baby blue color that will keep your newborn interested and safe in their surroundings. Assembling the Chico LullaGo is entirely straightforward. 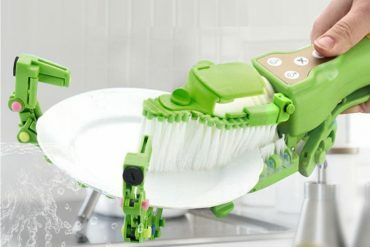 Every part snaps together such that you won’t be guessing where any of the pieces go. And when it is all done, you get a sturdy bassinet that is not only comfortable, but it is also safe for newborns up to the age of four months. With the brushed mattress pad, your baby will be feeling the warmth and comfort of sleeping in their space. Not to mention it has mesh windows to create a comfortable environment in your baby’s bassinet. 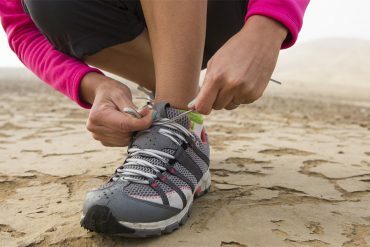 This model is designed with non-slip feet to keep it grounded and safe from sliding. You will like that all the fabric parts are washable making it easy to care for your bassinet. Lastly, you get to fold it down and use a carry basket for travel. 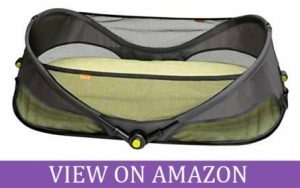 It is no wonder why it is a good pick for the best baby bassinet for travel. Sorbus Baby Crib Cradle is a hanging style baby bassinet. It is an excellent option if you want something to rock your baby to sleep at any time. 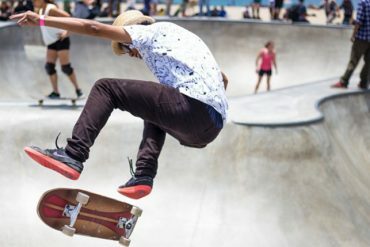 It provides you with the chance to use it anywhere, and you can even take it with you during travel. This bassinet has a nice concept. It can be the addition you want in the nursery, the sunroom, patio, or backyard. When you have a stable place to suspend this bassinet, your baby will be lulled to sleep in just a couple of minutes. 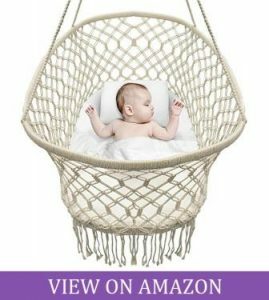 The bassinet is a bohemian style with two round hooks that you will use to hang it anywhere. It boasts a construction from 100% handmade cotton and complemented by macramé net pattern to give it the beautiful aesthetics. It even includes a soft pillow with cushion padding to protect your baby’s head. If you want a cheap but functional model, you will want to take a look at this best baby bassinet. When you want to move your baby from room to room, you will need a bassinet that supports those exacts needs. The Dream on Me Karley Bassinet is a top pick for the best baby bassinet. 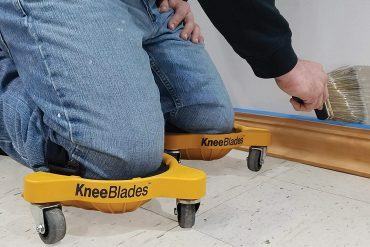 It has a lightweight frame that you can easily move to different rooms around the house. With only light assembly, you will get an elegant bassinet with a double canopy and a 1-inch mattress pad. The canopy is adjustable to full coverage, or you can pull it halfway when you need to shield your baby from sunlight. It can even be pulled all the way. This bassinet fulfills ASTM standards for safety so you will have the assurance that your baby is sleeping in a safe space. It even includes a storage basket underneath to help store your baby’s essentials like diaper changes and wipes. Not to mention, it is in a variety of colors so you can match it to the nursery’s colors. It is a fascinating piece that you don’t want to miss out on the feature-price benefits. As the name implies, the Delta Children Sweet Beginnings is a winner in giving your baby love in their infancy. It can support babies up to 15 pounds thanks to the sturdy steel frame and polyester fiber pad. You will be able to move it in an out of the nursery using the casters that can lock in position to prevent kids from rocking it back and forth while your baby is sleeping. 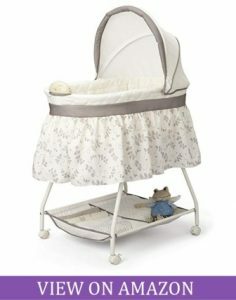 We love the neutral leaf fabric as it adds to the elegance you get only from the best baby bassinet on the market. Your baby will fall asleep to the soothing music, and you can check on them without turning on the room light. This is because you will be able to use the nightlight that will not stir your baby in their sleep. You have an adjustable canopy that comes in handy if the nursery is well-lit so you can give your baby a comfortable sleeping environment. Not to mention it has a large two-section storage basket. Your baby’s toys will be inches away for easy access. Are you looking for an affordable bassinet with flexible features? Well, Graco Pack ‘n Play Playard got your back. The newborn napper is reversible into a changer in a minute. This allows you to tend to your baby without involving too many items. The napper is thoughtfully made to offer a cozy feeling for every newborn baby. The playard is wide and spacious. You can use it from the time the baby is in infancy until they are 35 inches tall or tall enough to crawl out. The toy bar comes with toys to engage your baby’s playtime. You can also take this playard bassinet with you since it folds in one simple step. The push button transforms this unit into a foldable size that will be easy to carry in a trip. If you are traveling as soon as your newborn is home, you will be glad to bring the Graco Pack ‘n Play Playard. Get your baby into some fun activities with the BabymoovBabyin. 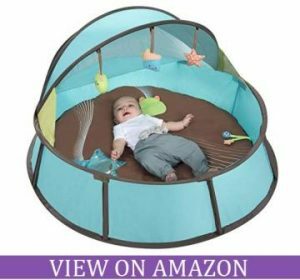 Labeled as an activity gym, this bassinet doubles as a napper, a play yard, and an activity center. It comes with six toys that include a rattle, tummy time mirror and soft toys for crinkly sounds. You can carry it to the beach and other outdoor activities with the assurance your baby won’t end up with sunburns. It does not only keep your baby protected from the sun, but also keeps out sand and wind. This bassinet has a bug netting that will act as a screen to keep out crawlies and flying insects from entering in the bassinet. It has a soft and thick mattress that is entirely removable. This newborn baby bassinet is more than you bargain for since you have a portable and well-made bassinet for all your outdoor excursions. If you can’t find the best portable baby bassinet or baby bassinet emirates, you may fall for the BRICA Fold and Go Bassinet. 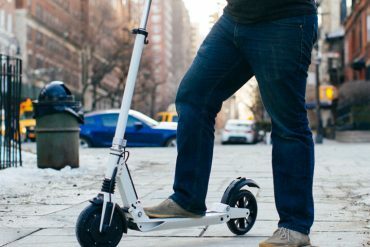 It is the most simplified design where you don’t have to deal with a standing frame. You just fold it, and it is ready to go. This unit comes with incredible features that include a tubular steel frame. It is robust to cater to the needs of a growing baby. With the fitted sheets and firm mattress, your baby will never sink since the mattress pad will not flex. The BRICA model features a T-locking frame for extra stability. 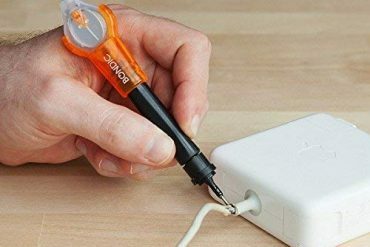 It will lock in four different positions using an audible click. This way, you will always know when the bassinet is ready to use. 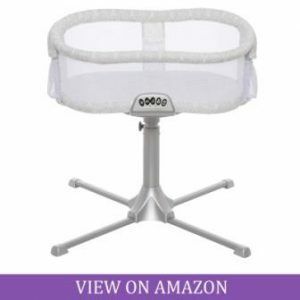 The bassinet then folds compactly with the help of the release buttons. Whether you want a newborn baby bassinet or a portable bassinet, BRICO will never disappoint. Fisher-Price Soothing Motion is everything you would like for your newborn. 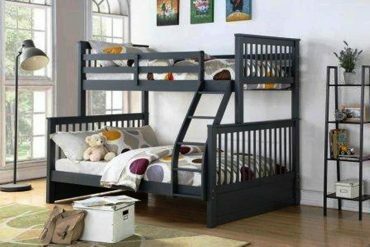 It is elegant, comfortable, safe, and it is loaded with play toys. It makes it to the list of our best baby bassinet reviews since it showcases features that allow your baby to connect to the world while being fully rested. This bassinet can sway gently to soothe your baby to sleep. It also has an adorable lighting option that creates twinkly stars to help in your baby’s brain development as well as keep them happy when they wake up, and you are not around to pick them up immediately. Not to mention, it has relaxing vibrations, sounds, and music that create the perfect soothing environment. The soft but firm mattress pad is a nice addition since you don’t have to buy a new one after spending on this model. 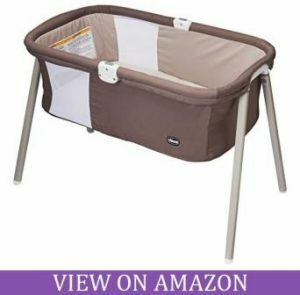 It is not a cheap buy but everything about it is all you would ever ask in the best baby bassinet. Safety Standard: Your baby bassinet must meet or exceed the safety standards stipulated by standardization organizations. You should look for ASTM and JSTM labels. This means they have undergone and passed stringent standardization tests to ensure they do not pose risks of suffocation. 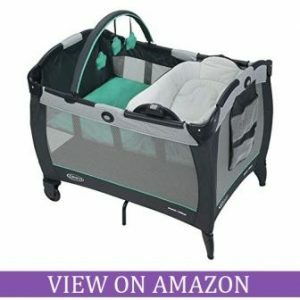 You will want to invest in a durable and stable bassinet that will not entrap your baby or have wide side slats that your baby could slide through if they turn in their sleep. Weight and Age of the Baby: Truth be said, your baby will probably outgrow the bassinet even before they reach the weight limit. 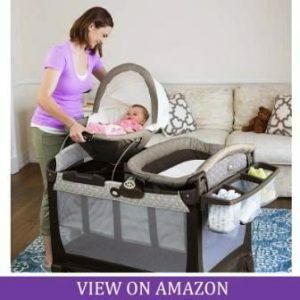 You will, therefore, want to look at a bassinet that is big and can hold lots of weight even if you plan to move the baby into a crib as soon as they are four months old. Mattress Support: To keep your baby comfortable, you will want to have the best matter fit for the bassinet. It should not bend easily along the edges. Also, the mattress pad and sides of the bassinet should not have any space between them. Portability: We love small bassinets because of how easy it is to move them from room to room. If you invest in a baby bassinet with wheels, you will need them to lock to prevent it from being moved. A foldable baby bassinet is better off than one you will need to disassemble since the constant assembly can get in the way of a proper set up which may be a danger to your baby. Looking for the Best Baby Bassinet can feel like searching through a maze of products. But we have done the research and found only the top-rated, safest, and most functional units for you. Here, you will find portable bassinets, elegant white bassinets, cheap, and premium bassinets to suit your exact needs. A newborn is a joy to every parent.